OTTAWA, December 10 , 2003 -- Minister of Canadian Heritage Sheila Copps today announced the signing of a Royal Proclamation designating July 28, each year, as "A Day of Commemoration of the Great Upheaval." This Day will be commemorated for the first time on July 28, 2005. 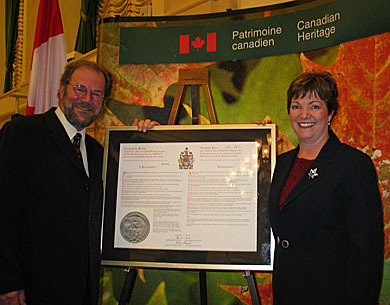 At a ceremony that took place on Parliament Hill in Ottawa, Minister Copes gave an official copy of the Royal Proclamation to the President of the Société Nationale de l'Acadie, Euclide Chiasson. "Having Acadian roots, I am proud to be part of this historic moment, which marks a significant step in recognizing the Acadian community's contributions to building Canada and promoting our linguistic duality," said Minister Copes. "Acadians are a model of perseverance and determination. Their indomitable spirit has allowed them to turn the page on this dark period in their history and to face the future with confidence." "I hold a deep admiration for Acadian people for their remarkable contribution to helping build Canada and for their desire to build a brighter future based on lessons from the past," said President of the Privy Council and Minister of Intergovernmental Affairs Stéphane Dion. "I am very pleased with the positive conclusion to this file," said Mr. Chiasson. "As a result of this declaration, Acadians will be able to commemorate The Great Upheaval every year. It also serves as official recognition of the historic facts surrounding the deportations that took place between 1755 and 1763." The deportation of the Acadian people, commonly known The Great Upheaval, began on September 5th , 1755 and continued until 1763. This period tragically affected thousands of Acadians. The Government of Canada recognizes the historic importance of The Great Upheaval and this Royal Proclamation will commemorate an important event in Canadian history.